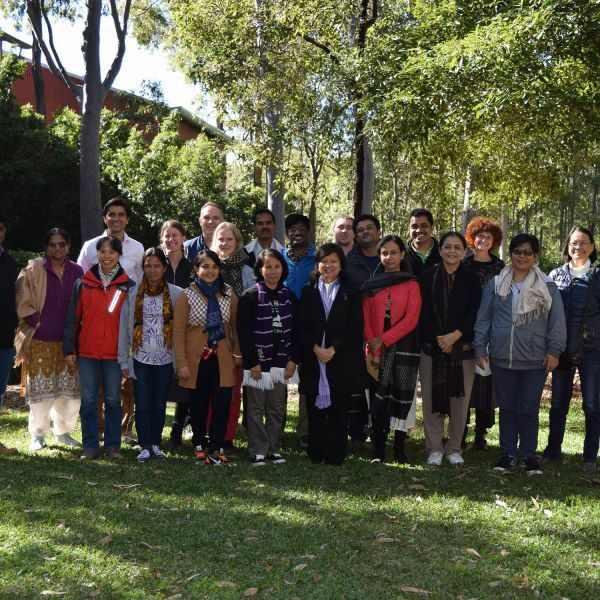 As part of her Department of Foreign Affairs (DFAT) funded research project, Chief Investigator Dr Sarah Wright from the School of Environmental and Life Sciences facilitated an international fellows visit for the Centre for Urban and Regional Studies (CURS) at UON’s Callaghan campus on July 4th. Joining collaborative academics from the project’s partner institution, Monash Business School at Monash University, 17 prestigious fellows (pictured with Dr Sarah Wright and Dr Shaun Roman, Assistant Dean International and Marketing), travelled from around the globe, representing stakeholder institutions in India, Bangladesh, The Philippines and Vietnam. The purpose of the visit was to highlight shared experiences and further enhance research capacities, outputs and networks, in the group’s combined efforts to develop resilient agri-food systems which alleviate food insecurity, protect rural livelihoods and build alternative value chains which empower farmers. This collective endeavour aims to address the DFAT priority area of food security, with a particular focus on intensifying sustainable and equitable agriculture practices in the regions of South and South-East Asia, where almost 342 million people are collectively food insecure and undernourished, according to the Food & Agriculture Organisation’s (FAO) 2015 State of the World’s Food Insecurity Report. In an effort to promote gender diversity and equality for marginalized groups, the fellowship consisted of farmer-leaders, academics, non-governmental organisation (NGO) workers and agricultural outreach workers. The representatives were specifically selected as a result of their diverse and invaluable expertise in malnutrition and hunger, gender and sustainable agriculture, Indigenous food systems and building local economies of scale through private sector linkages. The visit incorporated a range of nature-based activities, with several of the fellows voicing their gratitude, specifically acknowledging the day’s ability to facilitate collaborative connections. Newcastle Innovation’s Pro Vice-Chancellor for Industry Engagement and Innovation, Dr Sarah Pearson, also gave a ‘Welcome to UON’ address, which reiterated the importance of such visits to UON’s global impact regarding food security research.